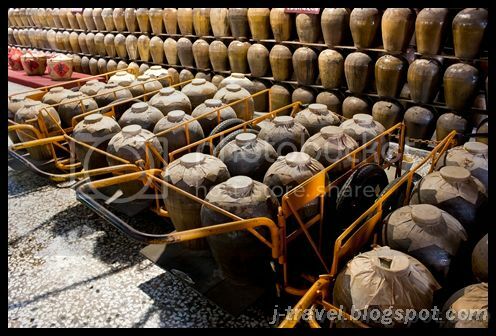 I am sure you have heard of Shao Xing Wine (紹興酒). But do you know what it is made of? Shao Xing Wine is actually made from Sticky rice, Penglai rice, wheat and spring water. Puli Winery is very famous for its Shao Xing Wine and they have won several awards around the world. If you know how to appreciate hard liquor, you will be able to smell its strong fragrance when you open it. But if you are not a drinker, it is ok too. There are a lot of snacks here also consist of Shao Xing Wine. For example, Rice Cake, tea egg and even instant noodles. Over here, you can get souvenirs, sample their wines and wine and visit their small museum to know about their history. Move aside, cafe-hopping! Now come BREWERY-hopping! 1 Do you want to understand more about the alcohol manufacturing process and Taiwan Winery history? If yes, you are in the right place!!! 2 You can sample their wines and their local snack for free. 3 Take some interesting photos using the interesting crops here.